Community care and customary care practices are at the heart of Weechi-it-te-win and alongside this is a concurrent obligation to be bi-culturally proficient. We recognize that our families’ needs are vast and there is no single way alone that will help all of our children, families and communities. 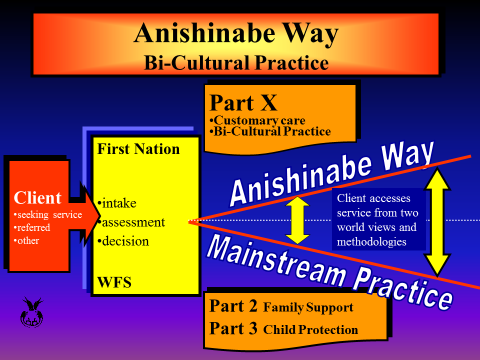 The professional standard of bi-cultural proficiency applies to both the child welfare and non-mandated (voluntary) service streams at Weechi-it-te-win. Bi-cultural proficiency enable us to respond to the needs of children and their families from the point of referral in a manner that is consistent with their needs and within the context of their culture and belief systems. These practices include both Anishinaabe and contemporary (western) methods of providing services; as well as Anishinaabe and contemporary (western) modes of intervention.